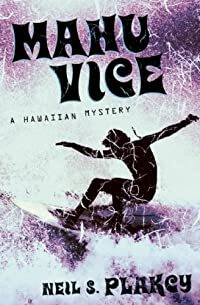 Mahu Vice by Neil S. Plakcy, a Mysterious Review. Review: Honolulu homicide detective Kimo Kanapa'aka investigates the suspicious deaths of a number of people indirectly linked to a series of arsons in Mahu Vice, the fourth mystery in this series by Neil S. Plakcy. A fire at a shopping center, owned at one time by Kimo's parents, requires Kimo to work with his former boyfriend, firefighter Mike Riccardi, with whom he had broken up over a year earlier. Kimo isn't sure if he still has feelings for Mike, but doesn't want that to stand in the way of his investigation of the dead body found among the ashes. Then two more bodies are found, this time shot execution style. Kimo's case gets infinitely more complicated when blackmail enters the picture and an online gay dating site, one Kimo himself had frequented over the past year, seems to be a common thread to all the crimes … and he's prominently featured in a photograph that may be evidence for prosecution. Kimo now must discover who is behind the arson, murders, and blackmail before he becomes a victim himself. Kimo repeatedly says that his sexual desires (his way of phrasing it is far more colorful) get him in trouble. True as far as it goes, and it seems to go quite far here, but the primary problem with Mahu Vice is not with Kimo, who, given a chance, is a rather interesting character, but with the author and his inability to exercise any literary self-restraint. There is no single primary mystery plot here, but half a dozen or so secondary ones that are ever so loosely and conveniently connected. Any of these could have made for an interesting case, with maybe one or two side ones thrown in to add interest and conflict, or even as red herrings. As it is, there is too much reliance on coincidence to link everything together, and in the end, at least two of the cases remain unresolved, their characters curiously forgotten. Then there's the Kimo/Mike on-again/off-again relationship arc. What started as an engaging storyline in the previous book of the series is inexplicably turned into a tedious, drawn out and tiresome subplot here. It's always frustrating reading a book as crudely conceived and poorly executed as Mahu Vice. Plakcy can clearly write, and all the ingredients for a first-rate mystery are present; the end result, though, at least for this fourth entry in the series, is anything but. Acknowledgment: Breakthrough Promotions provided a copy of Mahu Vice for this review.